June 2018 June Sax Workshop Boston U., Tanglewood Institute, Lenox, Ma. December 2017 Amram Birthday, Theatre for the New City, Amram Three Lost Loves and Greenwich Village Portraits. November 2017 Soloist. Netzer Saxophone Concerto, ‘Luce Cantabile,’ with Boston’s Bach, Beethoven, Brahms Society Orchestra, Steven Lipsitt, cond. From Joseph Robinson-Former Principal oboe, NY Phil. Kurt Masur was often swimming upstream with French repertoire, so we wondered at the New York Philharmonic why he chose to record this album of Debussy and Ravel. The magnificent flute playing by Jeannie Baxtresser and the extraordinary saxophone playing of guest soloist Kenneth Radnofsky alone justify the decision. in addition, I believe our performance of "Afternoon of a Faun" is the best I have ever heard..
"Guest conductor Bruce Hansen leads the Chautauqua Symphony Orchestra and saxophonist Kenneth Radnofsky Thursday in the Amphitheater." The Istanbul State Symphony Orchestra (IDSO), conducted by Dorian Wilson, offered a premiere of a voluminous new work: Baris Perker’s “Alto Saxophone Concerto,” nestled between two masterpieces by Tchaikovsky, on Feb. 16 and 17 at Kültür University and the Fulya Art Center, respectively. I say “voluminous” because Perker’s plush setting for orchestra and saxophone feels like being enveloped in luminous Cinemascope. Its fresh shimmer and sizzle held its own alongside the old Russian powerhouses. American classical saxophone virtuoso Kenneth Radnofsky was the soloist for this piece, which was, in fact, written for him. And this was also Radnofsky’s debut in Istanbul. The occasion augured well for both Perker and Radnofsky: This concerto adds a significant opus to the limited repertoire of original music for saxophone and orchestra, and Radnofsky’s radiant performance of it set a standard for its new position in the genre. The first movement provided the sax with its most expressive and colorful melodic opportunities, while Perker’s eloquent orchestration provided an especially vivid setting for the sustained solo lines. Later he ramped up the energy military style, with continuous snare drum and bass drum patterns, leading to a definitive finale. In concerto tradition, there was a cadenza near the end of the movement; this one basically centered around one note, from which lines spun outward, but always coming back to the home base note, which then the orchestra adopted to re-enter. The second movement was even more filmic. The muted and lovely orchestral part and attending murmurs from the sax gave a gauzy emotional landscape that was unmistakably Hollywood in scope and texture. Its tonality was traditional throughout, so it kept its harmonic spectrum on the tame but sweet side. Though this instrument is more associated with the jazz world, Perker’s language is nothing like jazz, although it has moments of improvisational impetus. He explores the unique color of the saxophone’s timbre and lets it gleam; other times he takes it through vigorous calisthenics as both the main event and embellishment. And embellishment is what the sax became for much of the third movement where it was almost an accessory to the orchestra’s wonderfully compelling themes and textures; in particular, a section with a blissful series of cascading woodwind chords. The movement achieved a long and slow crescendo to the end, although I didn’t think the phrases for the soloist at that point bore their most inspired material as a final statement. Conductor Wilson kept the electricity on and the momentum high throughout the Perker as well as Tchaikovsky’s “‘Romeo and Juliet’ Fantasy Overture” and “Francesca da Rimini” -- two pieces that mine the depths of drama and romantic passion with a seemingly endless supply of rhapsodic and fatalistic themes. Wilson drew out a splendid energy from the orchestra, including everything from very tenderly played wind solos to the terrifying maelstrom depicted in “Rimini.” This program was one IDSO’s season blockbusters. The saxophone is a fundamental resource in the jazz band and in the symphonic wind ensemble, but it is generally considered the orphan of instruments in classical music; it is too recent an invention to have been readily welcomed into the modern orchestra, and only a few well-known masterpiece of orchestral music dare to use it (at that, usually in its alto size). The earliest well-known appearance of the saxophone in the orchestral repertoire is in Bizet’s l’Arlésienne of 1872, and the number of great concert works using it is small ?- I think especially of Berg’s Violin Concerto (1935), Rachmaninoff’s Symphonic Dances (1940), and of course Ravel’s Boléro(1928), which calls for three different sizes; nor should one overlook Milhaud’s ballet, La création du monde (1923), in which the saxophone actually substitutes for the solo viola in the string section. There is a considerable solo repertory as well, especially of concertos with orchestra. The moving force behind many of these was the German-American Sigurd Rascher (1907-2001), who did more than anyone else in the first half of the twentieth century to make the saxophone a serious and cherished concert instrument. I still remember, too, a fine appearance with the Boston Symphony Orchestra of the French saxophonist Marcel Mule in 1958, playing solo works by Jacques Ibert and Henri Tomasi. For the last quarter century and more, the banner of the classical saxophone has been proudly carried by Boston’s own Kenneth Radnofsky of the New England Conservatory, who has played all over the world with orchestra and without, who has faithfully served composers by commissioning and performing dozens of new works, and who at least in this writer’s opinion plays the classical saxophone more beautifully than anyone else in the world, though he had some heartwarming competition from some of his students at the fascinating “Saxtravaganza” in Jordan Hall on February 19. Copland’s Quiet City (1940) is usually known as a concert piece for English horn, trumpet, and strings. What we heard was advertised on the program as a premiere of incidental music “with original orchestration” in a “concert adaptation” by Christopher Brellochs, in which the saxophone substituted for the English horn. Whether Copland’s own sketch for the piece included a saxophone instead of the English horn, Copland himself did not remember when asked years later; but I found that the saxophone’s tone blended extremely well with the other instruments — clarinet, trumpet, and piano — perhaps even more effectively than the English horn would have in this small grouping. In the familiar orchestral version, this contemplative, undramatic piece is more about the trumpet than the English horn, which is one reason I particularly enjoyed this unfamiliar version with saxophone. Accompanying Radnofsky were Jonathan Cohler, clarinet and bass clarinet; Terry Everson, trumpet; and Eliko Akahori, piano. Another felicitous arrangement was Harold Shapero’s Saxophone Quartet, which was originally his String Quartet of 1941, but adapted by Pasquale Tassone with Shapero’s advice and blessing. The grouping of soprano, alto, tenor and baritone saxes has been tried by many different composers, but success always hinges on a good performance, and this one, by the NEC Quadrivium Saxophone Quartet, was really excellent, with outstanding ensemble and perfect blending of tone, sensitive to every nuance. If there was a difficulty with the arrangement, it was with the inescapable need for the B-flat soprano instrument to sound in its highest register, following the course of the original first violin, and there were times when one might have preferred a clarinet in those very high and somewhat strained reaches. But this was hardly ever a serious problem in the total sound, which was as effective and convincing, indeed, truly beautiful, as I have ever heard from a saxophone quartet. (All too often the sax quartet medium is poorly blended, rough, poorly in tune, and too aggressive; just listen to NPR’s “All Things Considered” for an example.) The players in this fine group were Michael Couper, Derek Beckvold, Ryan Marsh, and Jon Amon, reading from the top down. The Quartet itself is in four movements, a strongly neoclassical work with pandiatonic harmony such as Shapero’s somewhat older American contemporaries like Berger, Carter, and Copland particularly enjoyed, or even a little like Stravinsky’s American works of the 1940s. The craftsmanship is solid at every point, the counterpoint vigorously rhythmic, and the melodic writing spacious. This was especially evident in the warmly expressive third movement, which begins with a dialogue of upward major thirds, followed by a middle section in different layers of thirds, and concluding with answering upward minor sixths. In this year when we celebrate Elliott Carter’s centennial, it was natural to hear an early work of his, a Pastorale for saxophone and piano (1945). This may be identical with a Pastorale for English horn or viola or clarinet with piano, listed in Grove as written in 1940. It was displayed in several successive sections of quite different character from slow to fast to slow to very fast, with recitative-like dialogue between sax and piano and including two cadenzas, finally winding up with a jazzy section in fast staccato. One could hear in this little work that Carter’s path-breaking Piano Sonata was not far down the road. Radnofsky was ably accompanied by Eliko Akahori, piano. Two recent commissions made up the second half of the program. Gil Shohat, a composer from Israel, offered a Quintet for saxophone and string quartet (2008) that met with only mixed success. Much of the time there was an insuperable problem with balance: the tone of the saxophone, even in soft dynamics, so completely dominated the entire quartet ensemble that it was difficult to discern what was the total sound. I heard a mixture of very fast chromatic fingerwork, densely-packed chordal writing, and dance rhythms in an almost inaudible pizzicato. I especially liked the occasional transparent triadic harmony, opulently spread out as an accompaniment to warm, even sentimental melody which might remind one of songs of a century ago. Yet it was hard to be convinced by the eclectic assembly of styles. Nor could I tell whether the exceptionally wide vibrato in much of the cantabile string writing meant that the composer included microtones in the score. The Italian tempo markings given in the program were as tantalizing as they were elaborate: “Lento cantabile, dolce ma diabolico” had echoes of the beginning of Beethoven’s C major Mass, op. 86. Kenneth Radnofsky played with admirable control and restraint; the Portland String Quartet (Steven Kecskemethy and Ronald Lantz, violins; Julia Adams, viola; and Paul Ross, cello, whose fortieth anniversary was honored by this commission, collaborated valiantly. Yuan, a saxophone quartet (2008) by Lei Liang, was a relentless study in savage timbres of all kinds. Kenneth Radnofsky’s own group (Philipp Stäudlin, soprano; Eliot Gattegno, tenor; Eric Hewitt, baritone; and Radnofsky himself on alto) performed expertly, with remarkable technical virtuosity. 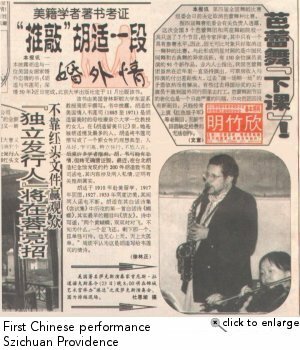 The composer provided a program note describing the work’s motivation from a tragic event during the Cultural Revolution in China in the 1960s. The piece itself began with wild arpeggios and scales in parallel clusters at high velocity and insistent fff dynamics. This yielded eventually to long sustained tones, much softer and widely spaced from top to bottom, so that it was possible to hear one note at a time and one harmony at a time. Constantly on display were a full arsenal of avant-garde techniques, including some admirable multiphonics, tongue-popping, fluttertonguing, fingers rattling the keywork, blowing air through the instruments, trills, tremolos, and at least two passages where all four players played only the mouthpieces, detached from the instruments, in long, sirenlike squeals — at one point expertly matched in pitch by the soprano sax, his mouthpiece by then reattached. (Perhaps Ravel said it for all time with this technique a century ago when, in l’Heure espagnole, he wrote a high B flat above the treble clef for contrabass sarrusophone, or, rather, just for its double reed.) The one technique that I missed in this work was playing the instruments without the reeds, using the bocals like cup mouthpieces, rather like the wooden cornetto or the ophicleide; but although I’ve heard this technique demonstrated on the clarinet I haven’t heard it on the saxophone. CAMBRIDGE - The Boston Modern Orchestra Project and director Gil Rose have cultivated a fascinating niche: aural snapshots of particular countries or national traditions. The past couple of seasons witnessed programs spotlighting France and Armenia; on Sunday, a concert sponsored by Combined Jewish Philanthropies and the Judaica Division of the Harvard College Library celebrated Israel's 60th anniversary. The Israeli government designated this the "Year of the Child"; thus the opener, a brief "Festive Dance" by 15-year-old Brookline composer Jeremiah Klarman. It's a charming curtain-raiser, deploying instrumental choirs with polish; Rose and the group provided fine, warm sheen. The musical content is readily tonal in a way that, through the afternoon's lens, recalled Meyerbeer, the Jewish pioneer of 19th-century French grand opera. Soviet-born Mark Kopytman's "Beyond All This," composed for Israel's 50th anniversary, drops Jewish folk-like motives into a sound-world recalling classic Eastern European modernism: simultaneous melodies smeared into rich clusters and haloes of close-quartered harmonies. Though often ravishing (and given a ravishing performance), the landscape rarely varies: Except for a brief episode of driving rhythm, the piece remains content with its gradual accretions of yearning lines. Paul Ben-Haim fled Nazi Germany to Tel Aviv in 1933; his 1947 Concerto for Strings overlays Hindemith-like neoclassical energy with Jewish musical accents in a similar way, and with similar results, to, say, Leonard Bernstein's early compositional efforts. Silesian-born Joseph Tal (who died earlier this year) eschewed a deliberate marriage of East and West; his 1953 Symphony No. 1 features a lyrical center derived from a Jewish-Babylonian lament, but the dominant vocabulary is an efficiently orchestrated European expressionism, pithy drama Rose and the players relished. Israeli-born Betty Olivero's "Kri'ot," a world premiere, mixed elements from numerous Jewish folk singing traditions into a loud, multifarious collage for saxophone solo (the redoubtable Kenneth Radnofsky) and orchestra. With busy, dissonant polyphony expanded to bracing scale, much was compelling from a standpoint of sheer sonic force, but Radnofsky's eloquence was largely spent on cantillated arabesques that never took on a distinctive thematic profile, and the dense orchestral activity became monolithic. Nonetheless, it was a provocative contrast: Where her immigrant countrymen selectively drew on those parts of tradition that readily combined with their European experience, the native-born Olivero tries to pin down the tradition's entire genealogy. Where Israel was the culmination of a dream for that pioneering generation, their children see a work in progress - inspiring both persistence and reimagination. ...especially the winds and brass. Thomas Rolfs's recurring trumpet solos were bright, clear, and ringing; Ken Radnofsky played the saxophone solos with an admirably warm and delicately inflected tone. It's hard to imagine two better collaborators for her than tenor Frank Kelley (a slim but sinister Fatty the Bookkeeper) and huge but graceful bass Phillip Lima (Trinity Moses). Jimmy's friends were also outstanding: tenor Matthew DiBattista as Jack O'Brien, who eats himself to death; baritone Tom O'Toole as Alaska Wolf Joe, who's killed by Trinity Moses in their boxing match; and baritone Stephen Salters as Bank Account Bill, who betrays his friend and ends up with Jenny. The small chorus of prostitutes and pleasure seekers was another significant asset. The superb orchestra included master saxophonist Ken Radnofsky and John Damian on guitar and banjo. ...tremendous -- 8 percussionists had their hands full, and there are poignant solos for saxophone, cello, and bassoon, expressively played by Ken Radnofsky, Jules Eskin and Richard Ranti, respectively. Even by Kenneth Radnofsky's usual generous standards, his presentation of four pieces created under the auspices of his landmark World-Wide Concurrent Premieres and Commissioning Fund proved remarkably bountiful. It's a pleasure to report that all the beneficent composers produced worthy responses. Plum Blossoms (2004) for alto sax and piano shows Shih-Hui Chen deftly handling a sound world that mixes Atlantic Seaboard grit and Oriental idioms such as pentatonic and whole-tone scales. A keen ear for timbral variety and felicitous delineation of a non-prescriptive binary structure further cast this work as a winner. For saxophone quartet and piano, Armand Qualliotine's Fantasia on B.A.C.H. (2004) shows that an East Coast approach can be downright lovely in the right hands. This piece takes full advantage of the delicious, romantic qualities one can conjure up from such a scoring. And the work's motivic economy, derived from the tetrachord alluded to in the title, provides sturdy pillars to buttress this beautiful exterior. The Jester, the Artist, and the Little Lion (2004), scored for cello, piano, and alto sax, is one of Howard Frazin's best works. Elegant and attractive, it inhabits a lightly clouded tonal world that ably weds aspects of Leonard Bernstein and Olivier Messiaen . There's plenty of intricate textural detail that pleases, too-it's charming without being lightweight. John McDonald's Transcriptions, Op. 397 (2004), for string quartet and alto sax, is unlike anything else your reviewer has ever heard by this tonemeister . Shot through with obsessively circular string ostinati , twisted sax cantilena lines, and fractiously granitic formal outlines, this is stark, nihilist music that truly disturbs. McDonald risks all here on an entity which some may think a mistake, while others (this critic included) consider it an evocative, remarkable work. The other recent selection encountered this evening also saw the largest number of players mount the stage. 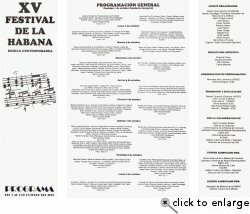 Big Epithalamium (1997) by Charles Wuorinen splits its sixteen alto saxophone performers into two antiphonal octets, parceling out close canonic fragments among them and framing it all with an opening and closing octave punctuation. It's brief and plenty strange, but definitely worth hearing. Performances were uniformly excellent. Radnofsky participated in all but Wuorinen's opus, showing excellent control of tone and fingers as well as an accomplished ear for phrasing. As part of the Radnofsky Quartet, he proved a sensitive complement to the formidable talents of Philipp A. Staeudlin (soprano sax), Eliot Gattegno (tenor sax), and Eric Hewitt (baritone sax). Hewitt also ably conducted Big Epithalamium , while pianist McDonald and members of the string foursome Sound Factory (Olivia DePrato and Chris Otto on violins, Beth Guterman on viola, and Lauren Radnofsky on cello) assisted splendidly elsewhere. LENOX -- The celebrations of John Williams's 25-year association with the Boston Symphony and the Boston Pops closed Saturday night with a dressed-up reprise of his wonderful "Evening at Pops" tribute to two film composers: his mentor, Bernard Herrmann, and his friend, Henry Mancini. This time there were two special guests, Martin Scorsese and Steven Spielberg. Scorsese hosted the Herrmann half of the program -- Herrmann's final film score was for Scorsese's "Taxi Driver." The director recalled telephoning Herrmann to ask him to participate. The famously gruff composer replied: "I don't do pictures about cabbies." But he did, writing in a jazz style and emphasizing the brass. Scorsese wanted one special sonic effect; Herrmann obliged, but it wasn't quite what Scorsese had in mind. "Play it backwards," Herrmann said as he left the room, and he was exactly right. He died later that night. The musical performances emphasized the moody, melancholy characteristics of Herrmann's work; Herrmann was an extraordinary musician, entirely familiar with the entire classical literature and with the avant-garde of his day. Saxophonist Kenneth Radnofsky contributed a piercingly sad solo to the "Taxi Driver" sequence. This recording of the Concerto for Alto Saxophone and Orchestra (1987) and the Paradiso Choruses (1974) represents an important addition to the Martino discography in that it makes available for the first time on CD two of Donald Martino's large-scaled works, virtually none of which are currently in the catalog. Yesterday noon's concert in the New England Conservatory's festival of Music Boston in the 1990's was devoted to music for saxophone - three of the festival's leading composers, Gunther Schuller, John Harbison, and Daniel Pinkham have written works for this instrument and for a particular performer, Kenneth Radnofsky, whose students played them. In addition there was a Sonatina by John McDonald, which was also written for Radnofsky. In the context of saluting Boston's composers of the 90's the festival has also indirectly honored some of Boston's principal composers of their own time and place and for whom so many of these works were written. Radnofsky has been one of them, of course; one admired his sense of adventure and his generosity in handing over "his" pieces to the next generation. All four pieces were terrific, and together they made an entertaining and varied program. McDonald's piece, "Big Crunch," was written in honor of Stephen Hawking's visit to Tuft's University last year;" the music responds to major images in Hawking's work- "the uncertainty principle" and the "singularity at the end of the universe." The music has color, drama, rhythmic drive, and imagination. Schuller composed a superb concerto for Radnofsky a few years ago; the Saxophone Sonata dates from last year. The first movement is calmly lyrical. A saxophone "cadenza," which includes a yearning statement of the generating tone row, links this to its finale that mingles jazzy melancholy. It is a very strong work with a powerful emotional undertow beneath its plaid surface. John Harbison's "San Antonio" Sonata has become one of his greatest hits. Each of the three movements is a contrasting dance propelled by Latin rhythms. Thoroughly actual, here and now, the sonata as a whole also tells a little story about a romantic little "might have been" evoked with a shiver of reminiscent excitement at the end. Harbison has been an amazingly prolific composer, and not by taking the easy road- he never repeats himself. Pinkham's "Up at Dawn" is a piquant little march, originally written for trombone quartet but rearranged for saxophone quartet with the composer's characteristic practical resourcefulness. It is a genuinely witty piece, and part-writing becomes part of its delightful rhythm. The three pianists were first-class - McDonald himself charging at the instrument with characteristic brio; Sarah Bobb, poised in the Schuller; Jen Komatsu responding to Harbison's demands with charismatic attack and infectious rhythm. The saxophonists, all of them well-trained students of Radnofsky, were on the same high level - Brian Mackintosh in the McDonald; Eric Hewitt, summoning the qualities of a bel canto singer like Sinatra from his instrument in the Schuller; Chien-Kwan Lin displaying spirit, stamina, and chops in the Harbison. Each played so well one was convinced that he would have brought something equally individual to the other pieces. CAMBRIDGE- as a means of observing Kenneth Radnofsky's 30 years of teaching the saxophone, this concert presented nine works by living composers. In all of these Radnofsky was playing the saxophone. The occasion was also a gathering of friends, many composers included, and not (the cynical take note) just those whose music was being performed, either. You might think that gathered up in one place, that number of new or newish pieces might be offering just as many answers to the question of what a saxophone piece might be. That was the case. Radnofsky seems the type who'd be ready to take on practically anything. well, think what a master orchestrator like Duke Ellington, in his world, brought about. "The classical saxophone exists!" this recital asserted defiantly. How close the usages came to familiar jazz and popular ones depended on what you were hearing. In Lei Liang's candidly titled "Peking Opera Soliloquy" the sounds were pretty much the same in-your-face, barnyardlike aspirates you hear from the Peking Opera recordings. The 42 measures of Michael Colgrass's "Preview" put the instrument through its paces, exhaustively, meanwhile coming that close (but not quite) to being a tango. Jakov Jakoulov's "Bernstein 'Anniversary' " tried its hand, all at once, at being a concerto movement (cadenza included), turbulent "modern' music, and evocation of the Mahler ("Das Lied von der Erde") that Bernstein loved. How many layers of irony played around about John Harbison's "San Antonio" Sonata - was this sometimes-serious light music or Harbisonian gravitas deceptively wreathed in smiles? Among the workout pieces, the improvisatory - sounding element in David Amram's might have come any which way, whereas Donald Martino's was terse, spiky, purposeful. John McDonald's Sonata scored for animal high spirits, Gunther Schuller's Sonata for seasoned compositional craft, Pasquale Tassone's Divertimento for the varied kinds of animated conversation the saxophone and piano struck up during its course. Not a dud in the lot, one will notice; aural proof that Radnofsky chooses his friends wisely. Donald Martino is a clarinetist and avid jazz composer (May/June 1996), so it is something of a surprise to learn that an Alto Saxophone Concerto (1987) is his first work for the instrument. 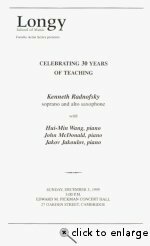 Predictably atonal and complex, it is given a first-rate reading by Kenneth Radnofsky, whose pitch is true and tone quality warm even in the high register and whose virtuoso technical skills are of the highest rank. The New England Conservatory Symphony, chamber-orchestra size here, sounds quite good. Paradiso Choruses was recorded and edited in 1975. Composed in honor of Lorna Cooke de Varon's 25th year of choral conducting at NEC, the 28-minute work is in three parts and alternates between tonality (heaven), atonality (hell), and "a transitional Purgatory". It is a monumental work for huge forces: nine soloists, a seven-woman solo group, a very large chorus augmented by boy and youth choirs, and a big orchestra. We hear the soloists up close, the orchestra nearby, and the choir at some distance. The hall is large, and this is a concert performance (texts and translations included). Regardless of our opinion of rambling work, we cannot help but be touched by the sense that an entire community is striving to elevate itself and us through an uplifting artistic statement. Note: Internet transcripts referenced in this article are no longer available online. The concert and online chat are available to all interneters in the world on the NSN home page at http://nsn.bbn.com/motet --which is the link to NEC's home page at http://copernicus.bbn.com/nec. March 13, 12:20 p.m. At WGBH 89.7 FM's studios, the Sumner Gerstein Theater is packed. Feels like Election Night at Studio Central. A cyberspace music premiere is about to happen. NEC saxophone faculty Kenneth Radnofsky with pianist/composer Larry Thomas Bell (of NEC's Extension Division faculty) and cellist Pamela Frame are preparing to perform live with "Classical Performances" host Richard Knisely as part of MOTET, an innovative live cyber performance initiative to teach music appreciation. Larry Bell's Mabler in Blue Light received its world premiere at NEC's Jordan Hall in December, and is about to be re-premiered on the Internet. Carried live on WBGH radio locally, the performance is also being broadcast live to National School Network Exchange schools and a worldwide audience on the Internet at nsn.bbn.com using Real Audio TM technology and desktop videoconferencing. 12:45 p.m. Cables everywhere, computers, telephones, photographers, a television crew, lights, action! Projected on a large screen from one of the four computer terminals, the performance, coming live from the studio across the street, unfolds in its multimedia form. Pictures in evolution, images in constant resolution, the focus shifts between the three performers. In small inset frame on the blown-up screen, Richard Kindly listens in through headphones, and concludes this special edition of "Classical Performances" by inviting listeners to tune in now on the Internet. 1:15 p.m. The performers have now re-entered real space and joined us in the theater to conduct the live online chat with students of the 20 National School Network Exchange schools. One by one, schools are now "coming in" to the virtual classroom, from Campbell Drive Florida, to the Rundle School in Massachusetts, with schools in Connecticut, Indiana, Pennsylvania, Wisconsin, California, D.C., Arkansas, New Jersey. One school in Germany is listening! 1:25 p.m. Close-ups on younger kids and teenagers as they approach the microphone or keyboard. Questions are pouring in, ranging from "were you pressured by your parents to study music?" to "how and why did you choose the saxophone?" More pointed questions turn to the structure of the piece and what mouthpiece to use. Answers are immediate, instantaneously typed in (on the ichat line) or spoken through a microphone (on CuSeeMe): candid, direct, always encouraging. "At school they gave me the sax because I liked the color and it fit my buck teeth." "We're always looking to reach new audiences in all possible venues and mediums." "Perhaps this is the way we will hear live concerts in the future," concludes Larry Bell. He hopes this enterprise will help put more emphasis on music in public schools, as "there is always the problem of whether we can afford to teach music in the schools, but people in politics and education have no trouble justifying the technology."